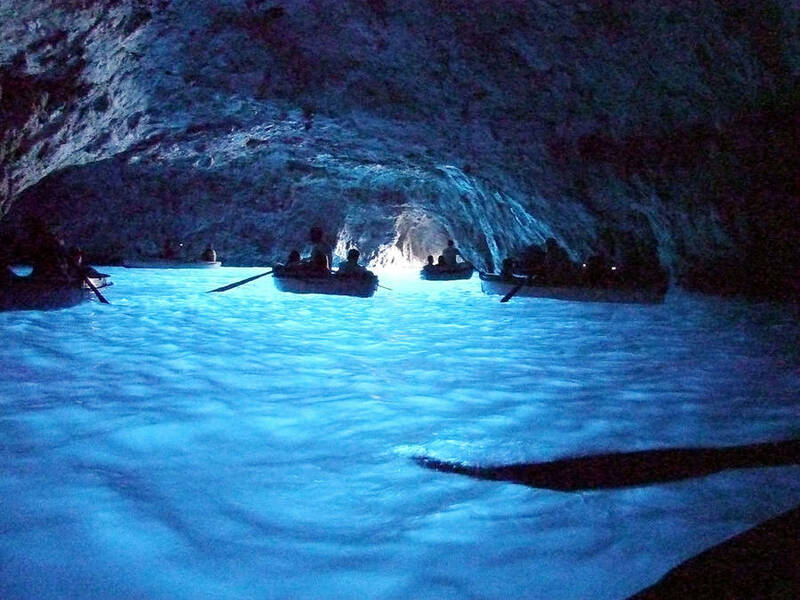 Capri's most famous sea cave, the Grotta Azzurra, is known throughout the world for the intense azure blue of its waters. 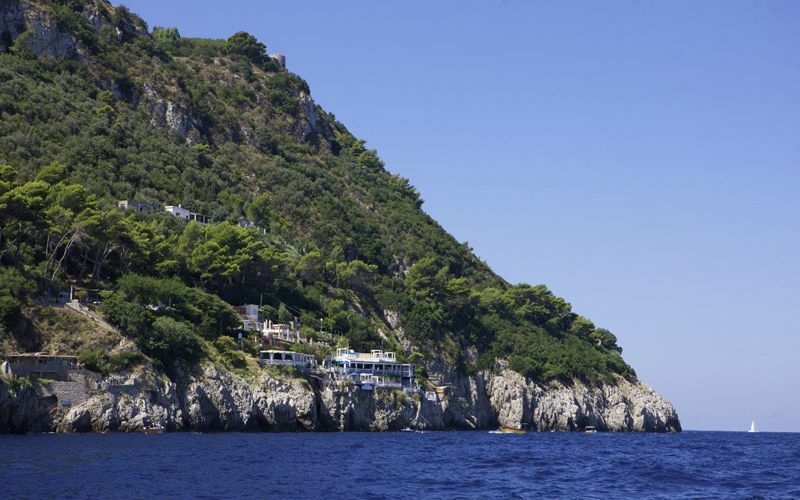 There are two ways of reaching the Grotta Azzurra: by sea, aboard one of the small boats which regularly depart from Marina Grande, or overland, via Anacapri, by taxi or bus. Those traveling as a family or with friends will find the cost of traveling by taxi to the Grotta Azzurra (by far the quickest and most comfortable overland option) only a little more expensive than the price of the bus tickets for the whole group. Visitors who decide to travel by public transport can board buses to Anacapri (the island's second town) in Marina Grande (the direct Marina Grande-Anacapri bus runs to coincide with a number of the ferry arrivals), or in the center of Capri (the main bus station is situated close to the funicular railway station and the Piazzetta). Once in Anacapri, they should get off at the stop near the "Cimiterio" (cemetery), from where buses to the Grotta Azzurra and the Faro (lighthouse) at Punta Carena depart. During the summer season, buses run approximately every 20 minutes. 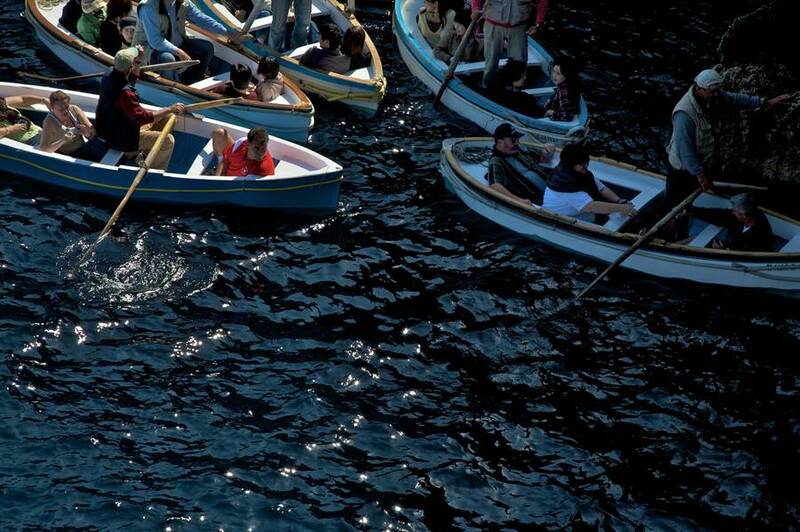 On their way to the Grotta Azzurra, passengers can ask to get off near what remains of the Ancient Roman Villa Damecuta, and visit the ruins of one of Emperor Tiberius' magnificent island residences. After a brief tour of the archaeological site, tourists headed to the Grotta Azzurra can either catch another bus or continue by foot (circa 30mins walk). At the start of the little road to Damecuta there is a picturesque shortcut (somewhat precarious) which shortens the walk considerably. To take a close look at the blockhouse visible from Villa Damecuta (the Fortino di Orrico), visitors will need to head to the Piazzetta di Orrico, situated along the road to the Grotta Azzurra, and from here descend the steps which lead all the way to the sea (a ten minute walk). The path which leads to the fort is, essentially, a continuation of the shortcut from Damecuta already mentioned. From the block house, once part of the island's coastal defenses, visitors can either retrace their steps and return to the main carriageway or continue in the direction of the "Sentiero dei Fortini" path, and head either towards the right (and the sea), to reach the Grotta Azzurra or to the left to take the Sentiero dei Fortini pathway all the way to the Punta Carena Lighthouse (3 hour walk). In the parking area close to the Grotta Azzurra (the main bus stop for buses to and from Anacapri), there is a flight of steps which lead to the mouth of the cave. 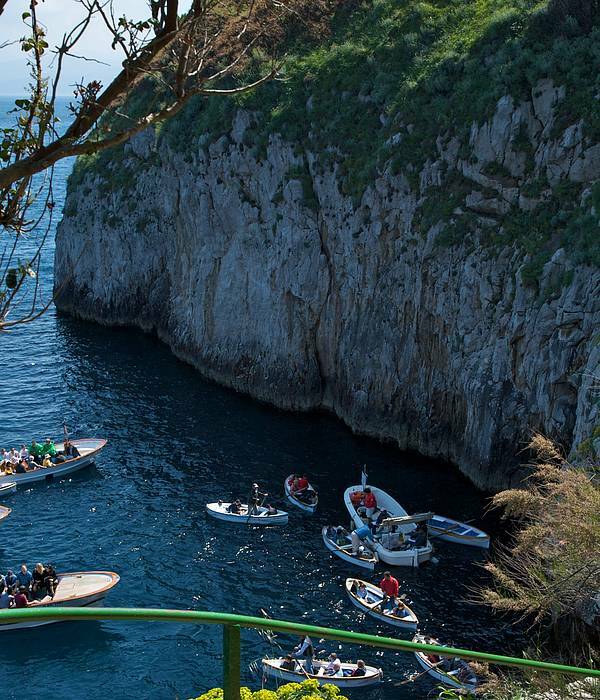 Here, visitors will need to pay the entrance ticket, which includes the boat ride into the cave. 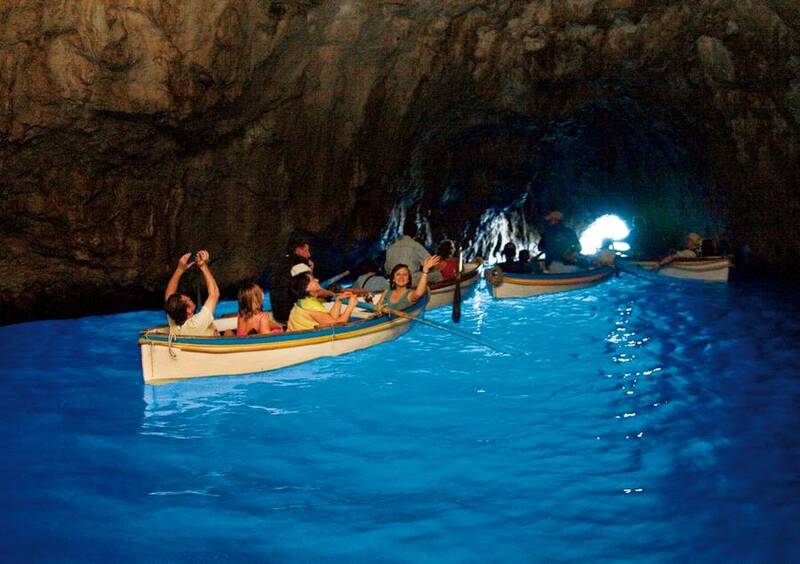 To enter the Grotta Azzurra visitors, climb aboard small rowing boats, which can carry a maximum of three people, lying on their backs, through the narrow opening and into the cave. The visit inside the Grotta lasts 5 to 10 minutes and tourists often have to wait for quite some time before entering. No matter how short the visit and how long the queue, the sight of the shimmering blue waters inside the cave is well worth every moment. 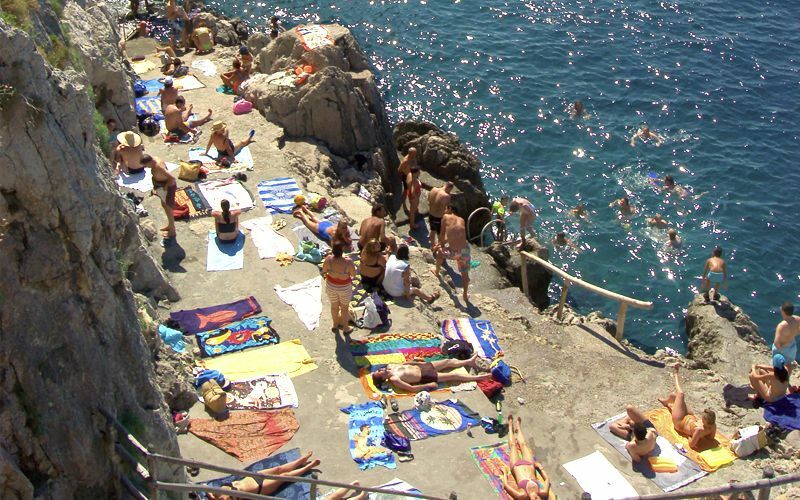 Close to the Grotta Azzurra, the little inlet of Gradola provides the perfect spot for a dip in the deep blue sea. Refreshment is available at a number of seafront eateries, including the highly acclaimed Il Riccio and the Nettuno bathing establishment. 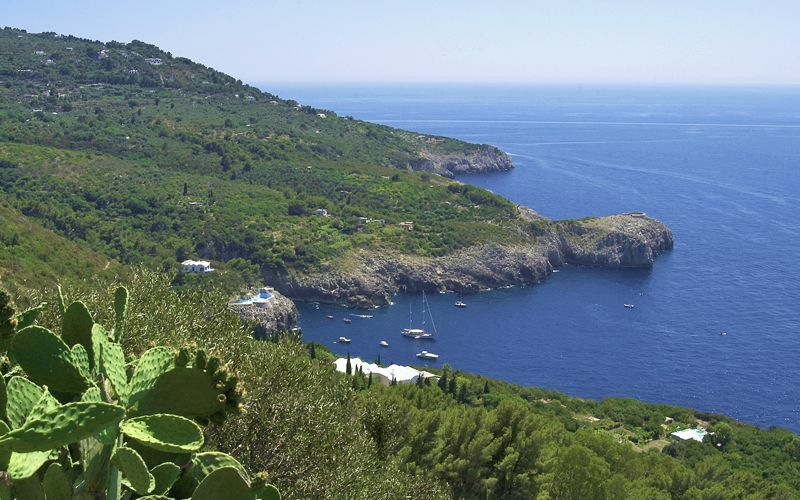 Visitors deciding to return to Capri by bus will need to take two buses, the first to the center of Anacapri and the second to Capri (or the port of Marina Grande). Close to the Grotta Azzurra there is a taxi stand, for those who would like to travel back to town in one of the island's stylish open top cabs.